Mcnab, Miriam. "Indigenous Women's Issues in Canada". The Canadian Encyclopedia, 17 January 2018, Historica Canada. https://www.thecanadianencyclopedia.ca/en/article/native-womens-issues. Accessed 26 April 2019. ​Aboriginal women today face many issues stemming from the circumstances and events of the colonial history of Canada and the imposition of a European patriarchal system on Indigenous societies. Aboriginal women today face many issues stemming from the circumstances and events of the colonial history of Canada and the imposition of a European patriarchal system on Indigenous societies. Not the least of these issues is the division of Aboriginal women created by legal categories imposed by the government of Canada's Indian Act, which serves to compound ancestral or national distinctions already in existence. 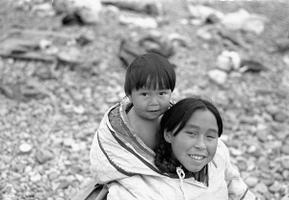 The different groups of Aboriginal women include First Nations, Métis and Inuit. Aboriginal people comprise roughly four per cent of the total population of Canada, with women making up 51.2 per cent of the Aboriginal population. The Aboriginal population is growing rapidly, with a 45 per cent increase between 1996 and 2006. By 2011, the population had increased another 20 per cent. More young Aboriginal women migrate to urban centres than do men, especially from small northern communities. This migration may be caused by the lack of opportunities for advancement on reserves and in rural areas as well as the perceived abundance of opportunities, particularly education, in urban centres. (See Aboriginal People, Urban Migration.) Studies also show that many of these young women are single parents. An issue which grabbed international attention through the 1970s and 1980s concerned legal discrimination against Aboriginal women and the loss of their treaty and Aboriginal rights should they marry a partner without status. The Canadian government's Indian Act discriminated against Aboriginal women in this fashion from 1869 until 1985, when Bill C-31 amended the Indian Act to remove the discrimination and bring the Act in line with the Canadian Charter of Rights and Freedoms. The 1985 amendment allows women who "married out" — and those who by other means lost their Indian status and accompanying rights and benefits — to apply for the restoration of their status and rights, and also allows their children to apply for registration as Status Indians. The Act no longer requires or allows women to follow their husbands into or out of status, and it allows women to pass status on to their children just as men always have. Since the implementation of the amendments to the Indian Act in 1985, the number of registered Indians has more than doubled, from approximately 360,000 in 1985 to more than 778,000 in 2007. The increase is a result of more births over deaths as well as through "reinstated" Indian status. However, while the amendment addressed much of the former discrimination against women, it also created some problems. By placing these women, and often their children, onto First Nations band membership lists, the government stretched already limited lands and funds to serve more people, and this has at times incited resentment and backlash toward these "Bill C-31s" by First Nations members. Further, the inclusion of a “Second-Generation Cut-Off” rule potentially means a great reduction in the number of people entitled to be registered as Status Indians under the Indian Act. According to Bill C-31, there are two categories of Indian registration. The first, known as sub-section 6(1), applies when both parents are or were entitled to registration. The second, known as sub-section 6(2), applies when one parent is entitled to registration under 6(1). Status cannot be transferred, however, if that one parent is registered under sub-section 6(2). In short, after two generations of intermarriage with non-status partners, children would no longer be eligible for status. Moreover, in order for a child to be registered, both the mother’s and father’s names must be included on the birth certificate. If the father’s name is not included, he is assumed to be non-status. In such situations, children born to women registered under sub-section 6(2) are not eligible for status. The amendment therefore significantly limits the ability to transfer status to one’s children. Aboriginal women have confronted unique problems stemming from stereotypes of them perpetuated by non-Aboriginal men since contact. The image of the “Indian princess” gave way to that of the promiscuous "squaw" which rendered Indigenous women vulnerable to violence and mistreatment. Early observations and oral history indicate that widespread violence accompanied the colonization of North America. The removal of Aboriginal people from their land, their placement on reserves and the loss of the traditional male roles of hunter-provider have caused role conflicts, frustration and anger which often finds its outlet in violence against women. High rates of domestic violence afflict Aboriginal women throughout North America. The Aboriginal Justice Inquiry of Manitoba (1990) noted that one in three Aboriginal women suffered abuse at the hands of her partner. The findings from the Canadian Royal Commission on Aboriginal Peoples (1996) supported the view that the constant challenges to the culture and collective identity of Aboriginal people weakened the communities and contributed to group and individual alienation that led some to self-destruction and anti-social behaviour. In 2009, 13 per cent of all Aboriginal women aged 15 and older living in the provinces stated that they had been violently victimized, almost three times the rate for non-Aboriginal women. Although Aboriginal women comprise approximately 4.3 per cent of the female Canadian population, they are significantly overrepresented among missing and murdered women. The issue gained increased awareness and attention after Amnesty International published Stolen Sisters: A Human Rights Response to Violence and Discrimination against Indigenous Women in Canada (2004) and No More Stolen Sisters (2009). Research conducted by the Native Women's Association of Canada (NWAC) established a database of missing and murdered Aboriginal women and girls. In 2011, the NWAC database included 582 known cases, most of which had occurred between 1990 and 2010. To help address the problem, in 2010 the federal government committed $10 million (over two years) to improve the safety of Aboriginal women and to ensure that the justice system and law enforcement agencies would improve their response to cases of missing and murdered women. In 2013, the RCMP launched an investigation into the problem of missing and murdered Aboriginal women in Canada. The report (published in 2014) revealed that from 1980 to 2012, a total of 1,181 Aboriginal women were murdered or were considered missing. 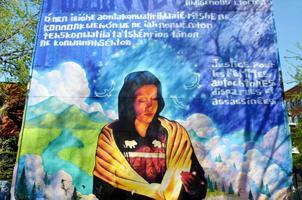 As of September 2013, 164 Aboriginal women were considered missing, 11.3 per cent of all missing women in Canada. As Aboriginal women comprise 4.3 per cent of the entire female population in Canada, this number is disproportionately high. More striking was the revelation that 1,017 Aboriginal women had been murdered in this period — 16 per cent of the total for all women homicides in Canada. In the wake of the RCMP report, calls for a national inquiry into the problem increased. The most vocal calls for this investigation came from the Native Women’s Association of Canada, as well as other Aboriginal organizations. In 2014, provincial and territorial leaders as well as opposition federal parties (NDP and Liberal Party) added their support for an inquiry. However, the federal government under Conservative leader Stephen Harper rejected this approach, and several experts have maintained that an inquiry would be cumbersome and would not yield any new answers. Since 2006, the Sisters in Spirit vigils have been held annually on 4 October to recognize missing and murdered Aboriginal women in Canada. Citizens across the country hold events including rallies, candlelight vigils, workshops and a moment of silence to bring awareness to the issue of violence against Aboriginal women. While many Aboriginal women share goals for the advancement of their people, their voices are often ignored by the Aboriginal leadership and male-dominated political organizations. During the Canadian Constitution talks of 1992, the independent national Native Women's Association of Canada was not granted a seat to take part in the talks with the federal government, provincial premiers and the four major Aboriginal organizations. Other Aboriginal women's organizations formed as dependent adjuncts to the national and regional bodies including the Métis National Council of Women (now Women of the Métis Nation) and the Saskatchewan Indian Women’s Association (now the Saskatchewan First Nations’ Women’s Commission). There are many small grassroots-oriented regional and local women's groups which receive little funding and therefore have difficulty operating in and serving Aboriginal communities. In 2012, there were 111 women chiefs out of 633 First Nations across Canada. Although the percentage of female Aboriginal chiefs in 2012 was only 17.5 per cent, this was slightly higher than the percentage of female mayors of Canadian cities. A growing number of Aboriginal women hold leadership roles in regional and national political organizations. Rosemarie Kuptana, president of the Inuit Tapirisat of Canada, Mary Simon of the Inuit Circumpolar Council, and Wendy Grant-John, the first woman to be elected Assembly of First Nations Regional Chief for British Columbia, were three of the earliest high-profile Aboriginal women. Nellie Cournoyea, a Northwest Territories MLA, became the first female premier of a Canadian territory (1991–95), and Ethel Blondin-Andrew was a Member of Parliament until 2006. Elected as a Conservative MP for Nunavut in 2008, Leona Aglukkaq became the first Inuk to be sworn into the Federal Cabinet when she was appointed Minister of Health. Aglukkaq stepped down from that post in 2012 to become the Chair of the (eight-nation) Arctic Council. Since July 2013, she has served as Minister of the Environment, Minister of the Canadian Northern Economic Development Agency and Minister for the Arctic Council. Shelly Glover, a Manitoba Métis, was first elected in 2008 to represent Saint Boniface, MB, as an MP, and is the first policewoman in Canadian Parliamentary history. In 2013, she was appointed Minister of Canadian Heritage and Official Languages. In the political arena, Aboriginal women may be underrepresented, but many are leading the way in the area of healing the wounds of colonization. In small, informal circles and large healing conferences attended by thousands, women are grappling with the issues of residential schools, missing and murdered women, abuse and violence, and drug, alcohol and other addictions. Amnesty International, Stolen Sisters: A Human Rights Response to Violence and Discrimination Against Indigenous Women in Canada (2004) and No More Stolen Sisters (2009); K. Anderson, Chain Her by One Foot: The Subjugation of Women in Seventeenth-Century New France (1991); S. Burt, L. Code and L. Dorney, eds., Changing Patterns: Women in Canada (2nd ed., 1993); K. Jamieson, Indian Women and the Law in Canada: Citizens Minus (1978); M. Kelm and L. Townsend, In the Days of Our Grandmothers: A Reader in Aboriginal Women's History in Canada (2006); D.A. Long and O.P. Dickason, Visions of the Heart: Canadian Aboriginal Issues (2nd ed., 1996; 3rd ed., 2011). Aboriginal Professional Association of Canada An organization that connects, supports and promotes outstanding leadership within the First Nations, Métis and Inuit community of professionals. Check their site for programs, services, and upcoming events.